The other day I was accused—not in public—of being "anti-Askey." Despite not even knowing what that really means—don't know the guy—I have to protest that I'm not in any way "anti" DPReview. It's an excellent and highly useful website, one I refer to frequently. Yes, okay, from time to time we get on our faithful mule, don our rusty armor, and take a gratuitous poke at the dragon. 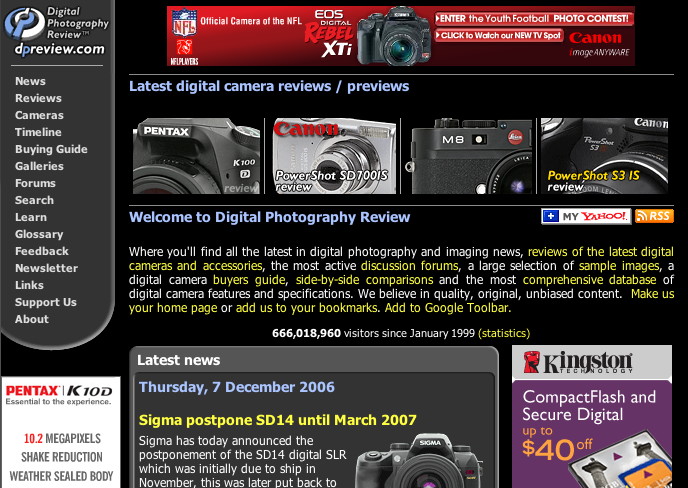 And I like the "Steve's Conclusion" segments of reviews on Steves-digicams.com better as digi-camera reviews—they're discursive, self-contained little mini-reviews in and of themselves, and generally give me all I need to know in a pill I find easy to swallow. And of course Luminous-Landscape is more entertaining. All things considered, however—and all that aside—DPReview is probably the premier digital camera site on the web. Probably the most popular, too. DPReview has a couple of flaws, both minor. First, they tend to chase away knowledgable people from their forums and calmly tolerate puerile infighting amongst noobs and pinheads—the brand-bias and put-downs can get intense. But only sometimes. There are a ton of good people on their forums too, and lots of good information along with the nastiness and absurd rumors. Then again, how can you really control forums? And the site simply needs an editor, as the English is not infrequently ungrammatical. At the same time, tyopos are minimal and sense is well communicated, and it doesn't seem to bother people. As I say, minor—easily made up for by the best interface online, the most thorough camera reviews, a very focused news page, and lots of auxilliary features kept spotlessly up to date. It's a very impressive showing. DPReview deserves its status as the default destination for gearheads and the most often accessed guilty pleasure for camera nuts of every stratum. And it gets an admiring A+ from me. A note on this report: Yes, all possible opportunities to use "Auntie Askey" in bad puns were examined, but rejected. Sorry. DPR is a real two-headed monster. Everything except for the forums (should I say fora) is A+. I always go there for research because the tests have solid methodology, but also have useful opinions. However, the forae ;) are something else. I have gotten useful info from time to time. People post so quickly that one can usually get an answer right back. My most recent post got me two answers within an hour. One individual very politely gave me the answer. The other rudely told me I should have searched harder. It does provide a gathering place for these nuts, which helps to keep them off the other boards. So every now and then I turn my BS filter up to 11, put on my boots, flip through some anger management books, and climb in to the forums to see what's new. To Phil - if he ever sees this - thanks for a really useful research tool. All the above is, naturally, IMHO. The question was something seemingly simple like: "What color space should I be using when I print from Photoshop?" There were plenty of opinions before I proceeded to comment, and the comments before mine were quite diverse in terms of their solutions. Of course, no one bothered to ask the guy what printer he had, whether he was on a mac or a pc (native gamma issues 1.8 vs 2.2), whether or not his monitor was calibrated etc etc. So I pointed out to the guy that no one could help him with his color space issues until they had actually seen his workflow in its entirety, from ingest to final print, and that the opinions of the posters before me were malinformed since they simply didn't have enough information from the guy to accurately base their solutions. In essence, I told him that everyone was wrong and that if he really was serious about color spaces, he should pick up a few books on color management and study them for good long time. Ban. Apparently a whole thread of posters (everyone who posted their opinions before me) were up in arms that they were all wrong, I had insulted the fabric of their being because who could know more than the average DPReview poster? I actually like dpreview's forums. As a source of knowledge, it's immensely useful to have a mostly unmoderated forum that, because of the highly factual and scientific nature of the rest of the site, attracts everyone who wants to be heard. It's like some mythical bazaar, where some stalls offer secrets and hidden insights, but most offer old and moldy fruit. You have to apply a lot of caveat emptor, but it's a worthwhile exercise. As for the site itself, its devotion to the purely technical aspects of photography, along with Phil's resistance to give any camera less than an "Above Average" review, stands as a stark contrast to some the more artistic sites. It's nice to read an analysis of a camera's strengths, rather than a scathing attack on the unacceptable and massive failings of relatively minor design decisions. But then what do I know. I was once happy taking pictures with a Fuji MX-2700. Phil's tests are among the best and there are a lot of good folks on the forums there. Problem is the too high precentage of weenies and trouble makers. They start rumors about cameras and cry because the 100% crop shows noise at 1600. They demand a apology from the manufacturer for letting such shoddy quality out on the street. The dpreview.com forums give me a headache. On the other hand, the reviews are second to none and really, all the raw data you would ever need to draw conclusions about cameras you might be interested in. Granted, it's clinical, but it's also consistent. What I like about dpreview reviews is the fact that they could double as an instruction manual for the camera. What I don't like about them is the fact that they're written from the perspective of someone who apparently never uses their camera, apart from test shots - an equipment geek, to put it somewhat more bluntly. Nothing on handling, nothing on useful little bits the camera may have etc. Personally, I'm far less concerned with how well all the computer thingies in the camera perform than I am with how well the camera performs as a tool for taking pictures. Then again, I only take test shots for demonstration purposes when I'm selling a lens, so I may not be quite the target audience.